Fancy switching on your car's engine using an app? Or replying to talking text messages sent to your phone purely by speaking? Or how about creating an in-car Wi-Fi network for your kid's Google Nexus 7? 'Smart' car features are everywhere and growing, but there's a growing realisation in the automobile industry that a flexible but standard backbone operating system would make the transition a whole lot easier. One of those systems vying for the business of the big car manufacturers is Chrysler's Sprint Velocity - and it does all of the above. 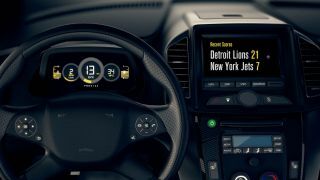 Although it already forms the core of Chrysler's Uconnect Access system (found on the RAM 1500 and SRT Viper supercar) and launched at last month's LA Auto Show, details were scarce, so TechRadar grabbed a few words with Sprint's M2M (machine-to-machine) marketing manager, Nina S Kim, at the Consumer Telematics Show on the fringes of CES 2013. "It's a complete end to end solution for the vehicle manufacturers," says Kim. "What we've done is taken all of the components that go into the in-vehicle telematics system itself and combined them with billing and data analytics." Sprint Velocity offers infotainment, though it's basically an open source telematics platform that can be employed - and modified, and re-named - by car companies. So while you're unlikely to know about Sprint Velocity per se, it's possible that it could be behind your next car's smart stuff in the guise of something branded. It's a system that depends almost wholly on a smartphone for its infotainment and communication aspects, because it attempts to mirror that device rather than replace it. After linking a smartphone via Bluetooth, Sprint Velocity can deliver spoken sports and news updates as well as turn-by-turn navigation, though among its standout features are texts-to-voice and voice-to-texts. Both are offered as a safety feature, but in effect it's the definition of convenience - especially since it uses natural-sounding speech. Uniquely, Sprint Velocity also enables in-car payment for services, and this is where it intends to do business. Sprint is no doubt hoping that this helps persuade car makers of its long-term worth, but it does enable some thoroughly useful purchases. "One of the key features it enables is on-demand Wi-Fi," says Kim. "If you're driving and you have, say, three kids in the back all using tablets, you can buy Wi-Fi from the console unit itself just for the day and connect tablets." The payment goes directly to the car manufacturer, though this kind of connectivity is obviously Sprint's speciality. "In the case of Chrysler's Uconnect Access you would have an account set up with a credit card and any purchases you make in-car go directly to that account," says Kim. Chrysler has taken the whole Sprint Velocity package and called it Uconnect, though manufacturers are able to mix and match various modules of it to create almost any kind of platform they want. Although it's designed to be easy to use, it's the younger generation that is the real target of Sprint Velocity. "They don't know a world without the internet," says Kim. Machina Research predicts that 90 per cent of new cars will have some type of connected platform by 2020.